A nutty wholegrain accompaniament for salmon. Over a medium-low heat, warm 2 tsp oil in a pan; sauté the onion for 8 minutes. Add the garlic, cumin and coriander and stir for 1 minute. Rinse the rice and add to the pan with the apricots and stock; stir. Bring to a simmer, lower the heat, cover and cook for 20–25 minutes. Meanwhile, warm a frying pan over a medium heat and dry-fry the nuts and seeds for 2 minutes, until they are just fragrant. A few minutes before the rice is done, warm 1 tsp oil in a frying pan over a medium-high heat. Season the fi sh and fry for 3 minutes skin-side down, then for 2 minutes on the other side. Stir the nuts, seeds and parsley into the pilau. Serve with the salmon on top and lemon wedges. 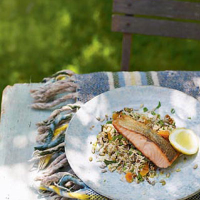 The blend of fresh citrus and light, smooth almond flavours in the wine will fit this salmon and exotic pilau perfectly.